There’s been some confusion on my part whether the Tecsun PL-880 is a dual conversion or triple conversion receiver. Amazon and eBay list the receiver as double conversion, whereas Universal Radio doesn’t mention either. After scouring the Instruction Manual, I was pleased to learn that the PL-880 uses the Silicon Labs si4735 DSP microchip and has 4 Intermediate Frequencies. To me, that looks like a triple conversion architecture. The combination of the DSP microchip, and the triple conversion would explain why my Tecsun PL-880 is so much more sensitive and selective than my Sony ICF-SW8600GR. My CountyCom GP-5/SSB emergency portable also has the same Silicon Labs DSP chip and it is almost as sensitive as the Tecsun PL-880, far more sensitive than the Sony. I’ve owned a Japan Radio JRC-525 and a Yaesu FT-900AT transceiver for many years, and the PL-880 digs out weak signals better than both those tabletop receivers, both dual conversion. To quell the speculation, yesterday I contacted Anna at Anon-Co, the worldwide distributor for Tecsun radios. Her quick reply confirms my suspicions that the Tecsun PL-880 is indeed a triple conversion receiver. That would explain why it blows my Sony ICF-SW7600GR out of the water in senitivity and its ability to pull out weak stations. Among all the other great attributes, this is an welcome discovery and one never mentioned in the specs by the various retailers of this receiver! Thank you Larry, for shedding light on this–Anna would certainly know. Your note makes me realize that I really should order a second, current production model PL-880. My PL-880 is from one of the first batches produced. I imagine I could benefit from some of the firmware tweaks that have been made to this receiver over time. Perhaps it would even be a good time to compare the 1st generation with the current generation? I just checked and Anon-Co is selling the PL-880 on eBay for $153.99 US shipped. Have any SWing Post readers compared early and late model PL-880 units? Please comment. 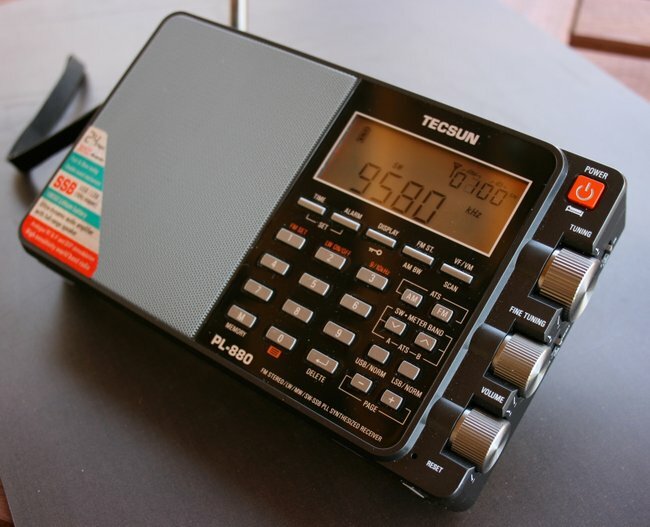 This entry was posted in News, Portable Radio, Radios, Shortwave Radio and tagged Anon-Co, Larry Thompson, PL-880, shortwave, Tecsun, Tecsun PL-880, Triple Conversion on July 20, 2017 by Thomas.